The CSUN Assistive Technology Conference is over for another year, and speakers, participants and attendees have scattered back to their various parts of the world. With an event like this, it’s always good to take a moment to reflect on what took place, how it went down and what people had to say about it. Luckily, there are several ways to do this. The first port of call is, of course, the conference website. 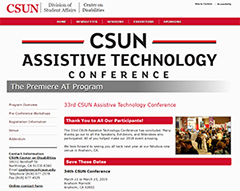 CSUN is California State University, Northridge, which has for 33 years hosted an event that has become the world’s largest conference focusing on assistive technology. While it’s obviously geared toward people thinking of attending, the conference website is useful for giving some idea of the scale we’re talking about. If you follow the SESSIONS link in the top navigation bar, and scroll down past the search boxes, you’ll reach the schedule of presentations starting at 9am on Wednesday 21 March. There are 20 such talks, all starting at 9am. Twenty! In just the first hour! This is not a one-track conference, or a two-track conference – this is a 20-track conference. This goes on for hour after hour for three days, an amazing roster of talks from which to choose – and every talk title looks at least interesting and very often compelling. The CSUN website makes it easy to browse the basic details of each presentation. Jamal Mazrui has done a great job pulling together slides and supporting material used in over 90 CSUN 2018 presentations, and he has made them all available for easy reference on Github. Mind you, that shouldn’t stop you exploring how and where the speakers themselves make their slides available. For example, Adrian Roselli built a very useful page on his website where he displays not only the slides from his CSUN 2018 talk Everything I Know About Accessibility I Learned from Stack Overflow, but also some useful related links and some tweets that put things in proper perspective. 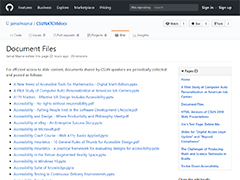 Christopher Phillips set up a crowdsourced Googledoc‏ where you can also find links to over 100 CSUN presentations and supporting material. Now, an event of CSUN’s size and range will inevitably generate some different perspectives. Here’s a few for comparison. 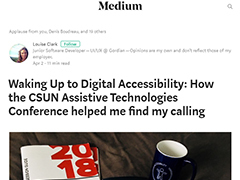 Louise Clark is a historian-turned-software-developer who attended CSUN and wrote a marvellous article called Waking Up to Digital Accessibility: How the CSUN Assistive Technologies Conference helped me find my calling. It’s really quite inspiring. Legalities associated with the rights of people with disability is already a rich field of interest and is getting richer as the impact of existing and expected legislation becomes clearer, particularly in litigiously minded USA, but also in Europe, Australia and elsewhere. Lainey Feingold has been a disability rights lawyer since 1992, and delivered the CSUN Digital Accessibility Legal Update three times at her 18th CSUN. 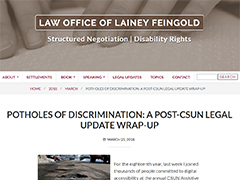 Lainey has followed it up with more detailed information about some of the topics covered in her article Potholes of Discrimination: A Post-CSUN Legal Update Wrap-up. Excellent reading. It’s important to remember that CSUN is an Assistive Technology Conference and is not just focused on web accessibility alone. Vendors demonstrate of dozens of technological advances to empower people with disability in all kinds of areas and activities. 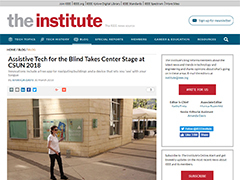 IEEE is the world’s largest technical professional organisation dedicated to advancing technology for the benefit of humanity, and its perspective on CSUN comes more from an engineering and technical point of view, as captured in their article Assistive Tech for the Blind Takes Center Stage at CSUN 2018. It’s not surprising that much of the mainstream media coverage of CSUN also focused on technology for people with a disability. 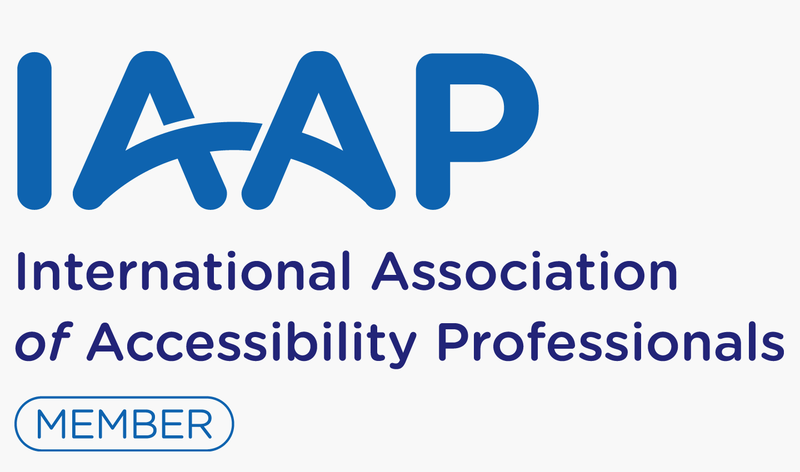 At least accessibility is getting some media coverage – maybe it will over time increase to include digital accessibility, advocacy and rights. 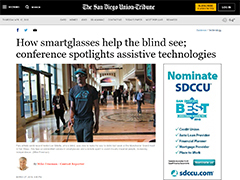 This article from the San Diego Tribune is a good example, How smartglasses help the blind see; conference spotlights assistive technologies. 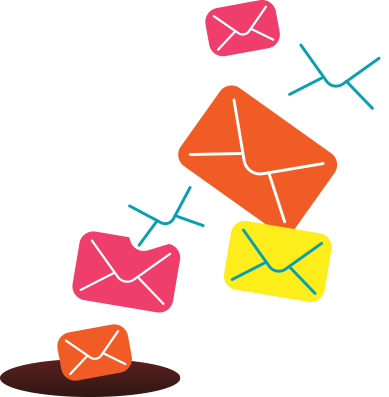 If you’d like to explore more of the CSUN 2018 goings on, two great places to start are Microassist’s CSUN 2018 Assistive Technology Conference Backchannel and Web Axe’s CSUNATC18 Wrap-Up—Resources and Tweets. We’ll be adding reflections from our own Intopia CSUN attendees over the next few weeks.